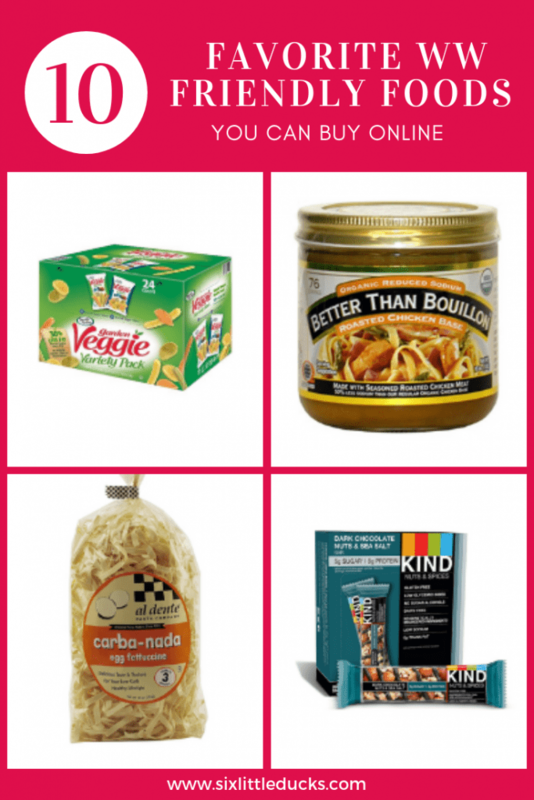 10 Favorite WW Friendly Foods You Can Buy Online! I am a BIG fan of online shopping, even for groceries. Life is too busy these days and online shopping has become a saving grace. Given our hectic lives, I am all about convenience, especially when trying to stick to healthy eating. The following are some of my favorite foods that I order regularly from Amazon. They are all WW friendly and fit into the plan nicely. 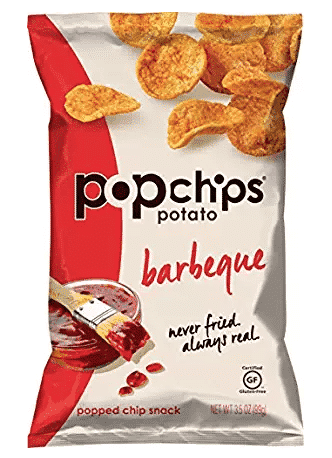 Pop Chips – Pop Chips are a low point crunchy snack that taste amazing! My favorite flavor is Barbecue but they also have many other flavors like Salt, Sour Cream & Onion, and Salt & Vinegar. I buy these in bulk because both my husband and I love them (he's been successful on WW as well). I buy them in the individual serving size bags because it's more convenient. If you want to save money you can buy the large bags in bulk and make your own individual servings. It will take a little time to do so, but saves you a little money overall. Reko Chocolate Pizzelles – I discovered these early on in my weight loss journey. I heard about them from someone on WW Connect who recommended them as a good low point cookie. I looked for them in my local grocery stores but all they had was the anise flavor (not my favorite). Enter Amazon 🙂 I also buy these in bulk as we go through them quickly! I crush them up and sprinkle them on my Enlightened Mint Chocolate Chip Ice Cream! Veggie Straws – Veggie Straws are another thing I buy in bulk in individual servings sizes. Again, I look for the time saving feature even though it costs a little more. Mornings are hectic and if I haven't had time to pack lunch the night before, these are any easy thing to throw in my lunch bag with a sandwich or salad. I love the Zesty Ranch flavored ones! Carba Nada Egg Fettucine – I am a HUGE carb lover. I've never met a noodle or pasta I didn't love. These were another thing I discovered through Connect. They are also another thing I couldn't find in the grocery store. Amazon once again came through for me. I order these 6 packs at a time as I go through them quickly. HUGE fan! Better Than Bouillon – Better Than Bouillon makes a great stock base for any soup or stew you want to make. I particularly like the brand because I am a vegetarian (although I do eat fish) and they have a wide variety of regular and non-meat versions. Sometimes I need a ‘faux' beef or chicken stock for soups or other typically meat-stock based dishes and they deliver. I've found Better Than Bouillon No-Beef and Better Than Bouillon No-Chicken bases work just like the real thing! I can find some of the flavors in the grocery stores around me, but I had trouble finding the No-Beef ones. I ordered it online and it was great! These need to be refrigerated once they are opened as they are more of a liquid than your standard bouillon cubes. Soda Stream Flavors – While I have tried many times to give up diet soda, I haven't yet succeeded. My husband bought me a Soda Stream many years ago trying to help me switch to seltzer. It worked to some extent in that I drink more seltzer in addition to my diet soda 🙂 I absolutely love the Diet Ginger Ale and have been drinking it for years. They changed the formula for the syrup for awhile and it was just awful. Thankfully they got enough complaints that they changed it back. Their other flavors are great too, as are the seltzer add-ins (lemon-lime, raspberry, orange). Kind Bars – You can find these in the grocery store but they are usually pretty expensive. I try price shopping them around online to get the best deal. If you follow the WW plan, they are expensive Points wise; however, if you're on the go and need a quick snack/meal, these fit the bill. They are all natural ingredients and are very tasty. They are better than any protein bar out there (which, as much as I've tried to like protein bars, I just do not). I like to keep one in my purse in case of emergency hunger. Premier Protein Shakes – Premier Protein is a very tasty pre-mixed protein shake (much better than protein bars in my opinion). They offer a variety of flavors with Cookies and Cream being the newest flavor and, subsequently, the hardest to find. I ordered it online from Amazon which was much easier than trying to hunt it down in the stores (which probably didn't have it anyhow). I add a Premier Protein to two shots of espresso over ice to make a very low point iced cookies and cream coffee. It's a very tasty treat, not to mention a great energy boost mid-afternoon! Trader Joe's – If you don't have a Trader Joe's within a reasonable driving distance, you can buy a lot of their products on Amazon. I'm lucky in that I have about ten TJ's near me (major metro area) but for those who don't, you can find all the TJ's goodness online. I'm a big fan of seasonings and Trader Joe's does not disappoint. I love the Everything But the Bagel seasoning, Trader Joe's Garlic Salt, and Trader Joe's Everyday Seasoning. Western Bagels – If you're a big fan of bagels (or carbs), you are going to love Western Bagels! They sell lower calorie bagels that taste like the real thing! There are multiple flavors on offer so you're sure to find one that suits your palate. If bagels aren't your thing, they also have pita bread and English muffins. They only ship on Mondays so plan accordingly. They send out coupons so definitely sign up for their mailing list. Also, it's best to buy in bulk to save on shipping costs. If you buy 6+ you can usually get free shipping. I buy them and stick them in the freezer until I'm ready to use them. The busier life gets, the more I find myself ordering online. Let's just say I make good use of my Amazon Prime membership 😉 With all the grocery delivery services out there, why not utilize Amazon or other vendors for the non-perishables? It saves you time and, many times, money too! P.S. If you're not a Prime member, try it now with a free 30-day trial!